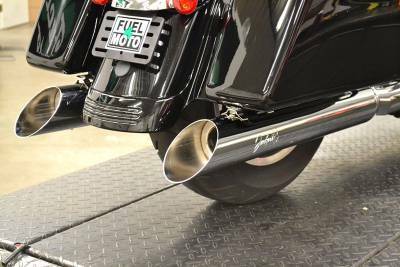 Welcome to Jackpot Mufflers, a division of Fuel Moto Inc. We specialize in performance exhaust systems for Harley Davidson Touring models as well as EFI tuning components. We are a full R&D facility and all of our exhaust components are developed from extensive Dyno testing as well as in real world conditions. We offer only the highest quality mufflers and exhaust components that offer superior performance, sound quality and value. 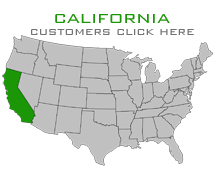 Our products include industry leading customer service, warranty and product support and our friendly staff can answer any technical, installation or pricing questions you may have on Jackpot products anytime, before or after the sale. Jackpot 2/1/2 head pipes are the highest quality, best performing head pipes on the market. Designed specifically for the performance and tuning characteristics of the twin cam engines these 2/1/2 head pipes provide proven performance gains with a broad torque curve other pipes simply cannot match. The Jackpot 2/1/2 features full stainless steel construction, dual 12mm & 18mm O2 bungs (plugs included), CNC mandrel bends, and each pipe is completely tig welded by hand, a true hand build work of art. The true standard for quality and performance. Jackpot 2/1/2 head pipes are also available with an optional multi-process HTC Ceramic interior/exterior coating for maximum heat reduction. This is an absolute top shelf coating and is a proprietary offering from Fuel Moto. The Road & Track exhaust is available in chrome or ceramic black finish. The large 4.5" billet end cap also features a unique carbon fiber inlay. Precisely vectored and formed CNC mandrel bent tubes assures full radius flow and exacting fitment, the header is constructed from 304 stainless steel (heat shields and muffler are steel) and each header is assembled and TIG welded by hand. The exclusive Jackpot large diameter merge collector allows maximum flow for optimum performance. The Jackpot Road & Track 2/1 features a large diameter "High Output" core for maximum performance and powerful sound. Jackpot Hi Roller mufflers were engineered for the ultimate combination of sound attenuation, top level performance, outstanding appearance and quality. The full length stainless steel cores were developed specifically to provide the low, deep, & powerful V-Twin tone riders are looking for along with dyno proven performance. Optional tuning inserts allow riders to tailor the Hp & Tq characteristics as well as sound level. 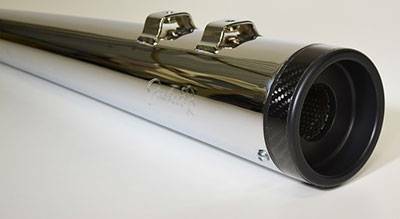 Mufflers are available in show chrome or black ceramic finish. End caps are machined from solid T6061 billet and are offered in chrome or black ceramic and are multi rotational, allowing riders to quickly and easily change between slash down & slash up configurations. The Jackpot M8 Slash mufflers for the Milwaukee-Eight™ combine excellent perforamnce, sound & appearance along with a great price! 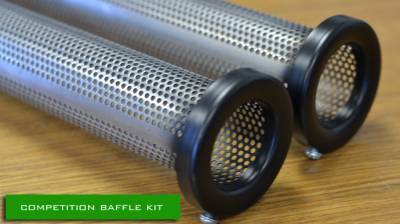 Sharing the same great full length perforated baffle cores as our Jackpot Hi Roller mufflers the Jackpot M8 Slash mufflers were developed specifically to provide the low, deep & powerful V-Twin tone riders are looking for along with dyno proven performance. Optional tuning inserts allow riders to tailor the Horsepower & Torque characteristics as well as the sound level. Mufflers are available in a show chrome finish with the Slash Up (matching the angle of the bags) and with Slash Down coming soon! 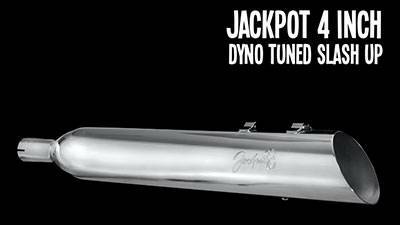 Jackpot Dyno tuned 4" mufflers feature our legendary Fuel Moto dyno tuned baffle system. We have spent countless hours testing different baffle designs, configurations and dyno tuning to offer the best performing slip on mufflers available. These mufflers were designed specifically to be used with the stock Harley head pipes, as well as a stage 1 air cleaner and Dynojet Power Vision or Power Commander (or appropriate EFI tuner). Jackpot mufflers offer the ultimate combination of performance and sound. The sound quality of these mufflers is truly second to none. 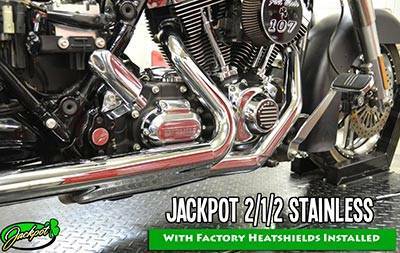 Jackpot Dyno tuned mufflers provide a deep, rich tone that provides a true V-Twin note. They emit a very reasonable sound level in the idle and cruise range areas, and a nice powerful rumble in the upper RPM's. 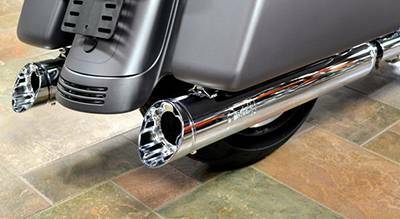 The Jackpot Pro Touring 4.5" mufflers represent the latest design in the Jackpot product line for Harley Davidson Touring models. Engineered with the absolute highest quality for the best overall performance, fit, and finish, along with the best possible sound, these huge 4.5" mufflers feature a heavy gauge tapered muffler body with a unique CNC machined 6061 billet end cap . These mufflers utilize our new V3 Dyno tuned baffles, an evolution of our legendary Jackpot Dyno Tuned asymmetric baffle system with Silent Sport Premium exhaust packing, the best on the planet. These high flowing Stainless Steel cores develop maximum horsepower and torque and provide the ultimate deep thumping exhaust note at a very reasonable dB level without any droning or low frequency resonance. 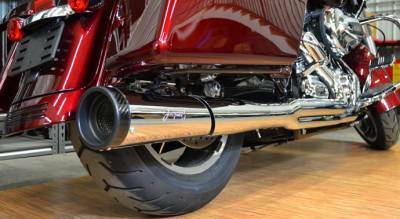 The Jackpot Classic Slip On mufflers are a very affordable way to get the sound levels you want. 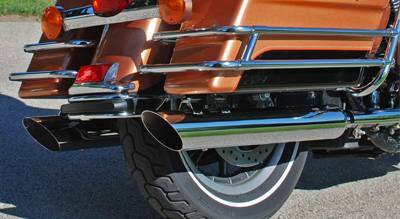 These mufflers are available in a show chrome finish in both a slash up or slash down cut. We offer many different Jackpot exhaust accessories to customize the sound levels to meet your needs. Whether you are looking to increase the dB levels or possibly looking for a quiet insert for early morning commutes, we have you covered!